In 2-quart saucepan, stir together strawberries, granulated sugar and cornstarch over medium heat. Heat to boiling; cook 1 minute, stirring constantly, until very thick. Cool completely, about 15 minutes. Unroll pie crusts on floured work surface. With 3 1/2-inch round cutter, cut 8 rounds from each crust. Moisten edges with water. Spoon 2 teaspoons strawberry mixture on half of each crust round. Fold untopped half of round over filling; press edges with fork to seal. Place pies on ungreased disposable foil pizza pan. Prick tops of pies with fork. Heat gas or charcoal grill to medium-high heat. Try to maintain heat around 350°F. Place foil pie pan upside down on grill to make elevated surface. Place foil pizza pan on top so it is elevated off grill. Cover grill; cook 12 to 15 minutes or until crust is golden brown. Remove from grill; cool 10 minutes. Sprinkle with powdered sugar. Store any remaining pies tightly covered up to 3 days. No time to make homemade pie filling? 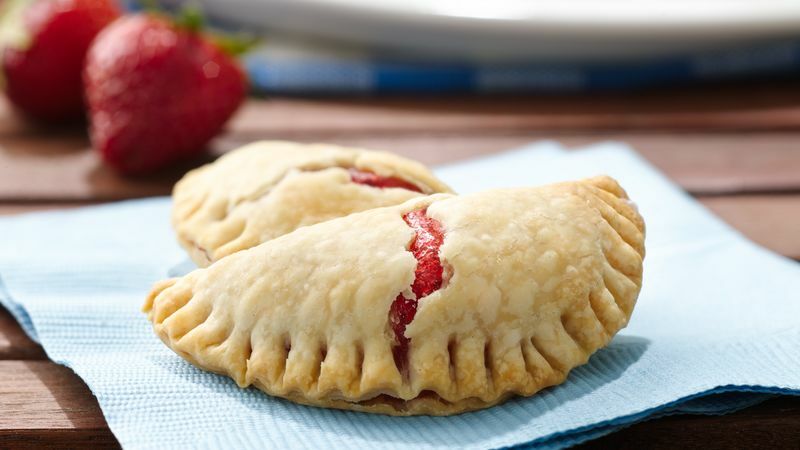 Use canned cherry pie filling or a dollop of strawberry preserves instead.